Word has it that home-grown eggs are the best! Not only are they fresh, really fresh, but they're eco-friendly, cutting down on large amounts of carbon emissions! The Large Urban Chicken Coop is designed to bring the opportunity to farm your own fresh eggs to urban dwellers. Our woodworkers specifically designed the Urban Chicken Coop to fit in an urban environment. This large 5' X 8' Chicken Coop can hold 10-20 chickens. The coop comes standard with an easy access egg collection box, a chicken door and ramp, one ventilation opening, inside roosts, and one door for humans too! These beautiful chicken coops truly are superior. Additionally, the Cottage Coop features predator-resistant wire mesh to keep your chickens safe, and optional easy skid runners for easy movement and placement. Optional Runners are zinc galvanized to prevent rusting. This chicken coop is available with the optional EZ-Skid runners as shown. The dimensional shingles that come with the chicken coop have a 25 year warranty and the optional panelized smart siding has a 50 year warranty. The chicken coop is made in your choice of horizontal unfinished pine barn siding or with vertical panelized smart siding which is treated, primed and termite resistant. This siding delivers the warmth and beauty of traditional wood but also has the durability and workability of engineered wood. Order a detachable run to allow for safe outside roaming for the chickens. Standard shingle color is dark brown; standard window color is white. This chicken coop ships in kit form with assembly instructions. Please feel free to call us toll free with additional questions. 1-866-272-6773. 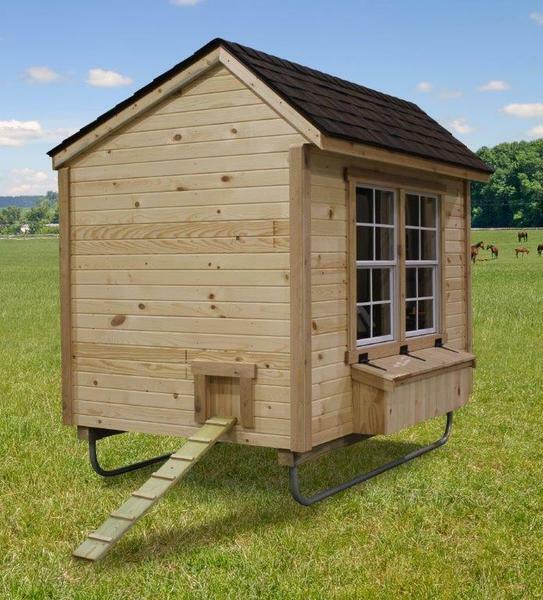 Looking for a different size or style then check out all of our chicken coops on our category page.